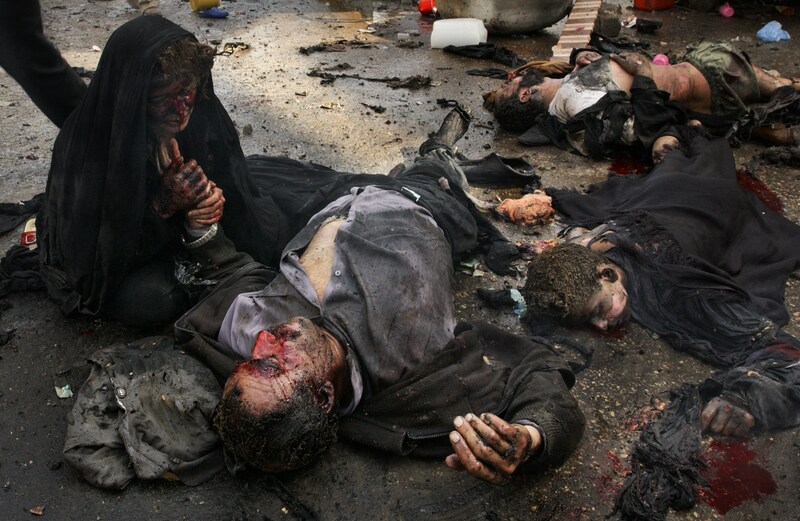 At dawn on 20 March 2003, 40 missiles strike Baghdad. The Second Gulf War is underway. The United States, supported by the Coalition of the Willing, accuses Saddam Hussein’s regime of possessing arms of mass destruction, of being in contact with Al-Qaeda terrorist cells and of governing in an anti-democratic fashion that violates human rights. Fighting alongside the Coalition troops are the Kurdish Peshmerga militias, and a combined land and air attack leads to the rapid conquest of the country’s chief cities. 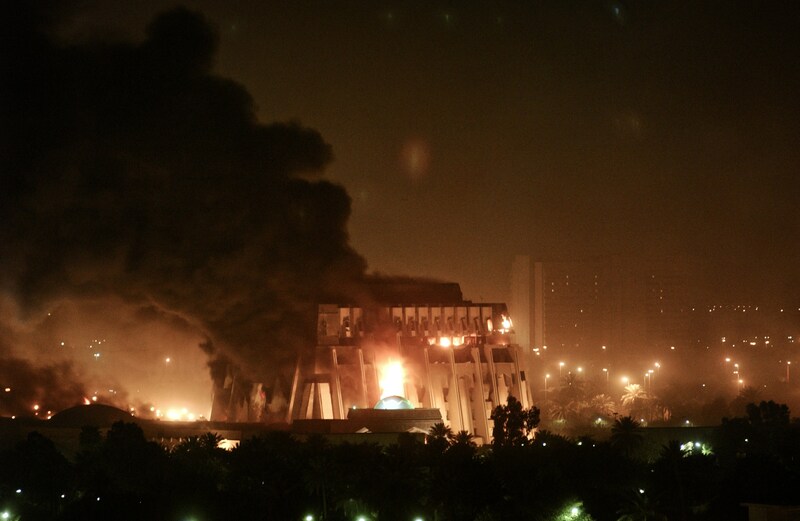 Baghdad falls on 9 April, forcing the Saddam Hussein to flee. On May first of the same year, American President George W. Bush declares: “Mission accomplished”. In December, following a less than fair trial, Saddam Hussein is sentenced to death and executed, to the joy of the Shiites. But what would appear to have been a lightening war, proves to be far different, deteriorating into a prolonged state of general instability and civil war that pits the international forces and the new Iraqi government, supported by the Kurdish and Shiite militias, against a primarily Sunni resistance movement that includes members of terrorist groups. 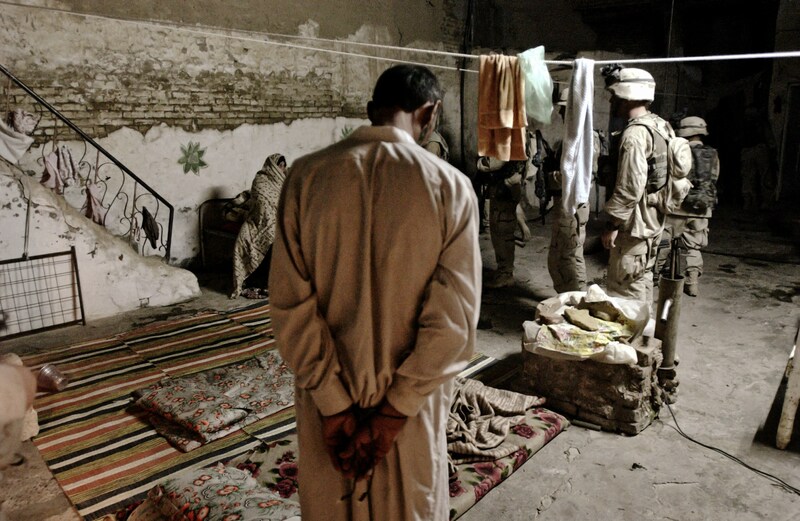 While attempts are made to find a solution through the political process, though with scarce success, a scandal breaks out regarding the torture and abuse of Iraqi prisoners by American and British soldiers at the Abu Ghraib Prison (2004). The episode sparks protest throughout the international community, forcing the American government to issue a public apology. Not only that, but the arms of mass destruction for which the entire conflict had been started prove to be non-existent, to the point that even the Chief Inspector of the UN labels them a huge falsification. The Iraqi people, already on their last legs due to the dire consequences of the embargo imposed under UN Resolution 661 of 1995 to punish Iraq following the First Gulf War, continue to live in extremely trying conditions, despite the pledges of aid from the Western governments, which are accused of pursuing economic objectives in one of the world’s largest basins of oil reserves. 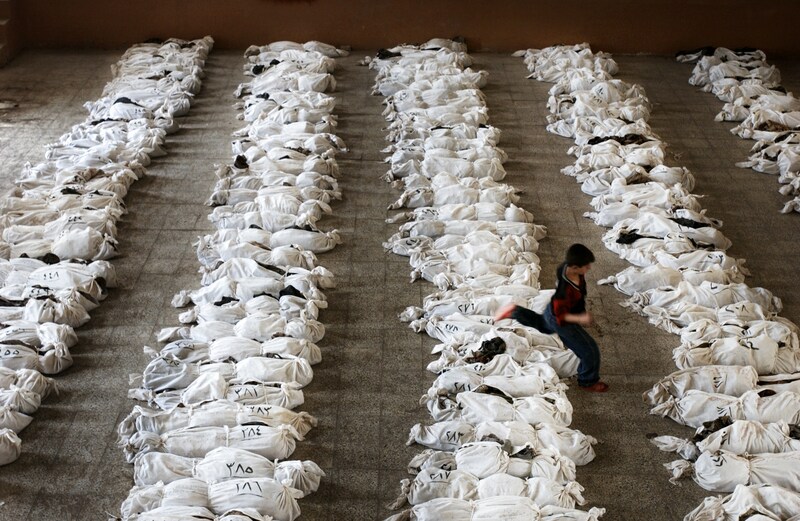 It is calculated that more than a million Iraqis have died. Riyad Saad, 22 (L) and Mayda Hashim, 22 celebrate their wedding in their house. Riyad and Mayda are first cousins, as the Islamic law doesn’t forbidden relatives to marry. Traditionally in Iraq, women have tended to marry in there 20s at the latest, but now, difficult economic conditions as a result of a decade of international sanctions have forced a change in marriage patterns. In Iraq, there are now said to be one million women over the age of 35 who are not married, which is not easy for the women waiting for marriage proposals and for the men who are expected to pay for the dowry, the marital home and the costs of raising a family. The problem is that after eleven years of sanctions most Iraqis are now desperately poor, relying on food distributions to survive. Many men feel they have little to offer a potential bride. 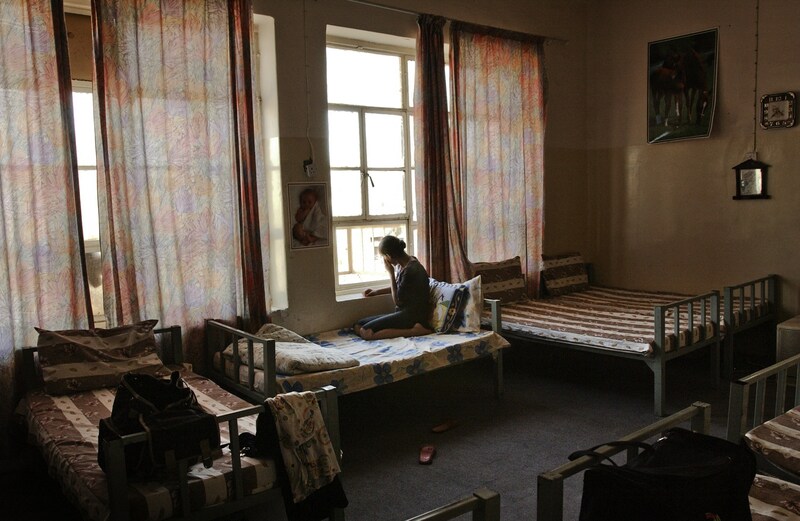 An Iraqi orphan looks outside her window in a local orphanage. The only local orphanage still open in the city, which was hosting about 60 children, is now only hosting ten due to a lack of food, clothing and medicine. 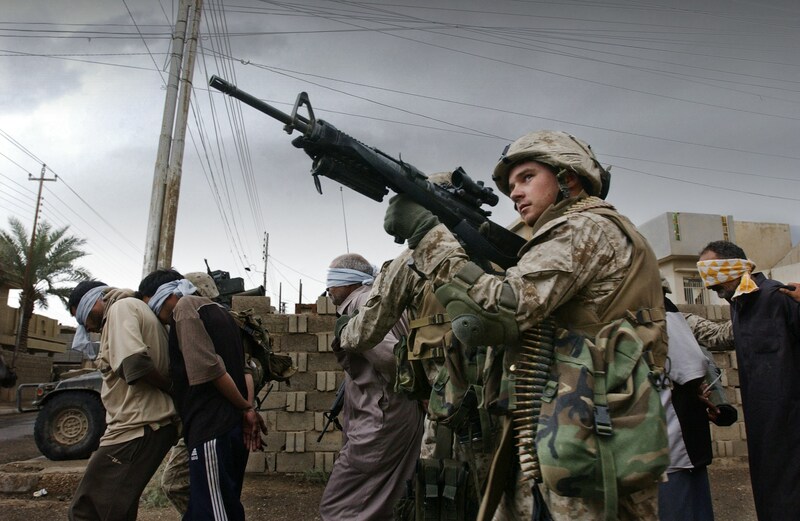 U.S Marines from the 1st U.S Marines Expeditionary Force, 1st Battalion, 3rd Marines Regiment, Bravo Company, bring back Iraqis arrested in a house during the offensive in Fallujah. Marines supported by tanks and artillery launched a major attack against insurgent pockets of resistance in southern Fallujah, searching house by house and arresting all males in combat age between 15 years old and 55 years old. 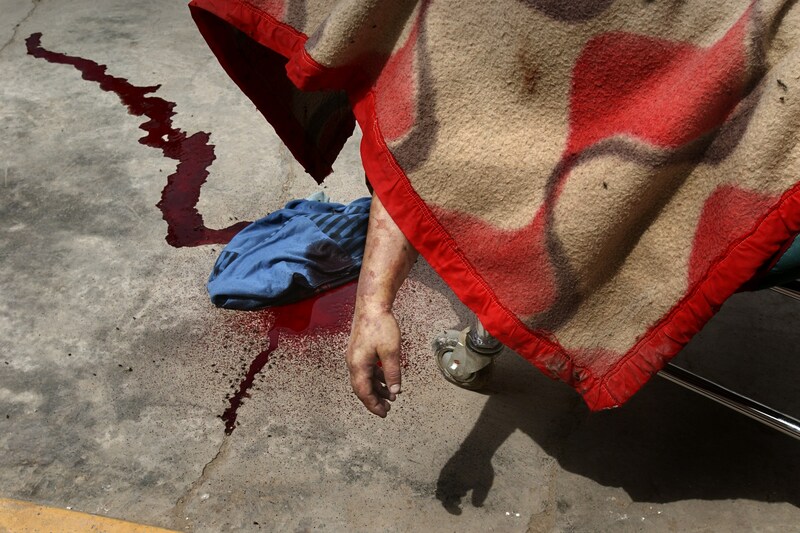 Blood drains out of the body of a slain Shiite woman killed during factional fighting between Fedyeen loyal to Saddam Hussein and Shiite gunman in the Shiite neighborhood of Saddam City, at the Chawadar Saddam Hospital. 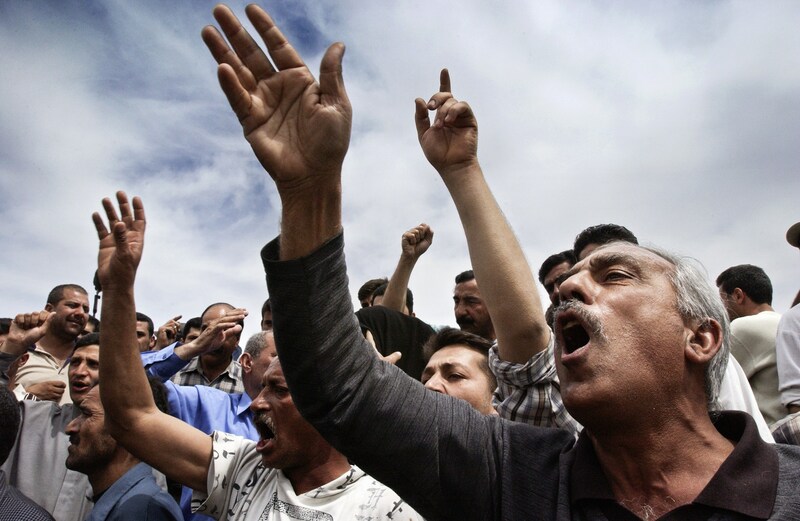 Wide spread looting broke out all over the capital as American forces continued to set up road blocks and patrols while the Fedyeen loyal to Saddam Hussein were still trying to carry out sporadic attacks against the U.S Army and the Shiite population of Baghdad. 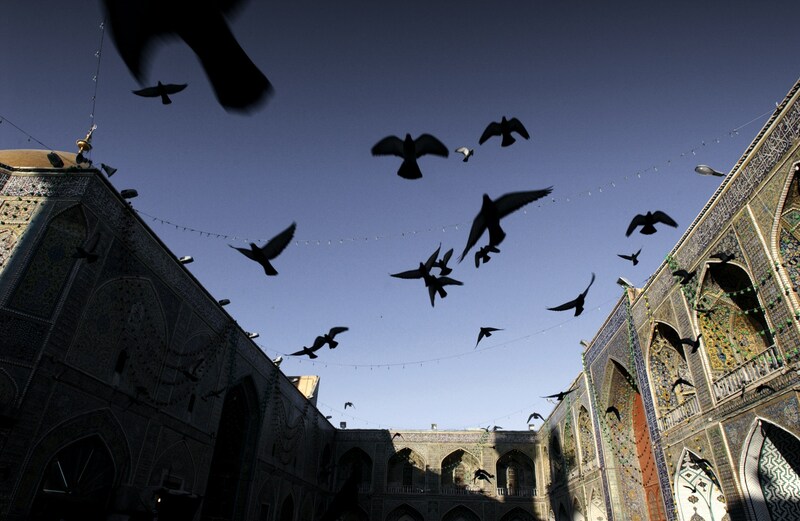 Pigeons fly over the shrine of Imam Ali at sunrise during a prayer held to celebrate Eid al-Adha. According to Ali, any Muslim buried in the holy city cemetery will enter paradise. Iraqis from all over the country come to the cemetery, which is the world’s largest Islamic burial site and the final resting place for generations of Shia Muslims, to mourn their relatives during Eid al-Adha. The Muslim holiday of Eid al-Adha (Festival of Sacrifice), takes place on the tenth day of the Islamic month Dhul-Hijjah, the last month of the Islamic calendar in which millions of Muslims from around the world make an annual pilgrimage to Makkah in order to worship Allah and to commemorate the willingness of the Prophet Abraham to sacrifice his son Ishmael. To celebrate, Muslims slaughter sheep, goats, cows and camels, and one third of the meat is distributed to the poor, one third to neighbors and relatives, while one third is kept by the person who offered the sacrifice for use within his or her own family. A U.S soldier secures during a small demonstration asks for police protection in front of the Palestine Hotel, headquarters of the U.S Forces and foreign media. Wide spreads looting broke out all over the capital as American forces continued to set up roadblocks and patrols. 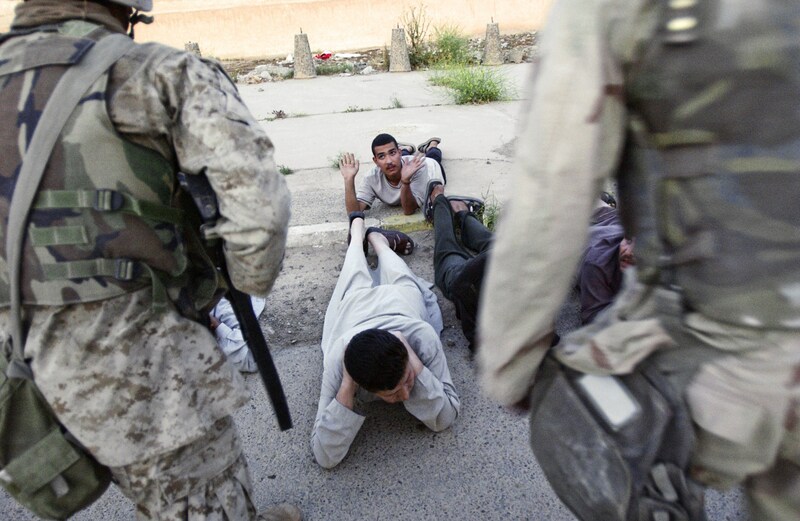 Iraqis arrested by U.S Marines from the 1st U.S Marines Expeditionary Force, 1st Battalion, 3rd Marines Regiment, Bravo Company at their Company Command during the offensive in Fallujah. Marines supported by tanks and artillery launched a major attack against insurgent pockets of resistance in southern Fallujah, searching house by house and arresting all males in combat age between 15 years old and 55 years old. An Iraqi child jumps over a line of hundreds of bodies, in a school where they have been transported from a mass grave, to be identified. They were discovered in the desert in the outskirts of Al Musayyib, 40 km south of Baghdad. 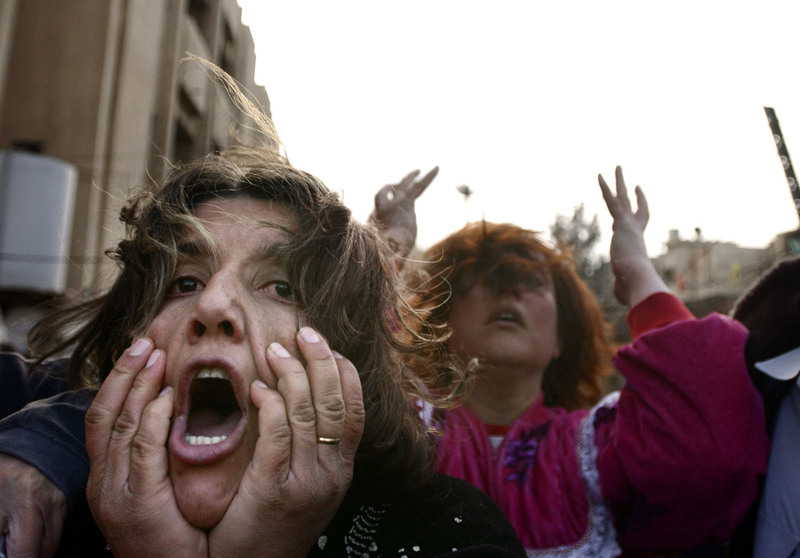 It has been estimated that between 10,000 and 15,000 Iraqis had been reported missing in the region south of Baghdad. People have been searching for days for identity cards or other clues among the skeletons to try to find the remains of brothers, fathers, mothers, sisters and even children who disappeared when Saddam’s government crushed a Shi’ite uprising following the 1991 Gulf War. 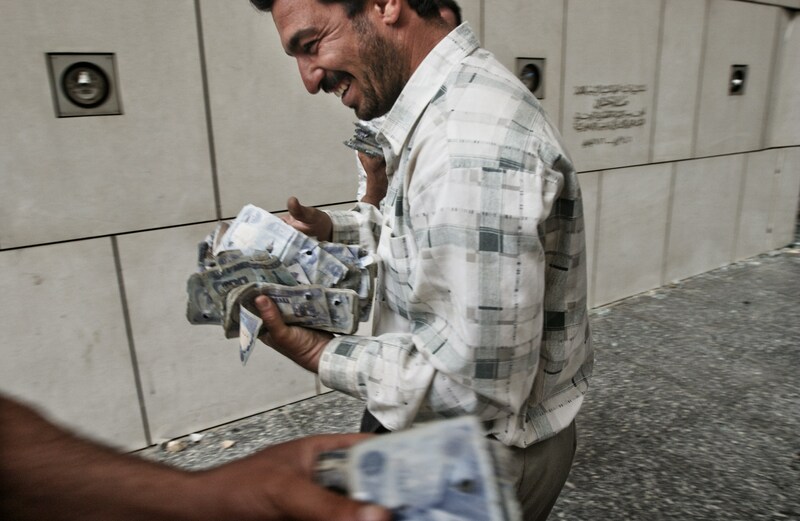 An Iraqi looter walks out from the Iraqi Central Bank with a pile of bank notes prior the arrival of the U.S. Marines to secure the bank. Since wide spread looting broke out all over the capital, American forces set up joint patrols with Iraqi Police officers to search for guns and stolen vehicles and to secure the population of Baghdad. 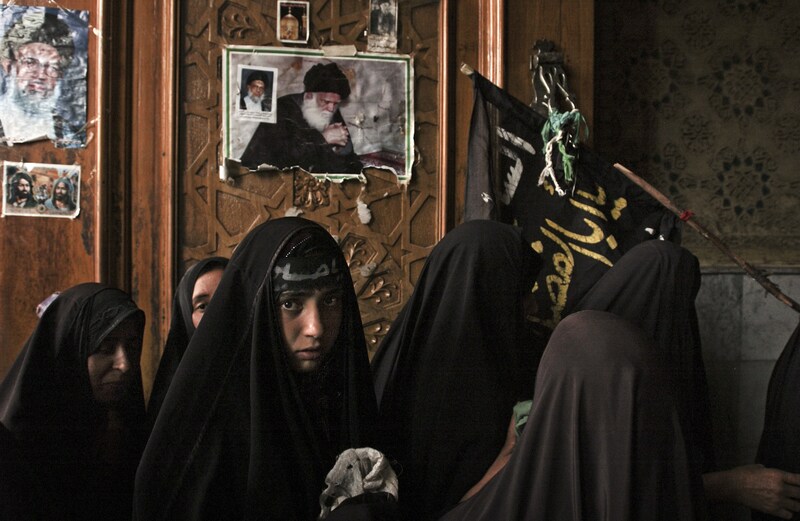 Shia women pass by the holy door of the Abbas Mosque during the annual pilgrimage to pray at the holy shrines of Abbas and Hussein, which was banned by Saddam Hussein for the last twenty-five years. The city of Kerbala, was strongly influenced by the Persians who where the dominant ethnic group, making up 75% of the population at the turn of the 20th century, at the time when there were around 50,000 people in the city. Kerbala also suffered from severe water shortage, which reduced the numbers of pilgrims. The building of a dam at the head of the Husayniyya Canal in 1737 largely solved the water problems. The city replaced Isfahan as the main centre of Shia scholarship and Kerbala maintained strong links with Iran. The Kammuna family, related to the Shahs, was custodians of the shrines and practically ran the city until the time of the British mandate when control of the city passed to seven mukhtars who started to receive a salary from the municipality who were succeeded by Iraqi government employees. The piety and unshakeable belief of the Muslims who visit the sanctuaries is illustrated by heart-rending acts of devotion such as kissing the grails that surround the shrines. Baghdad city hit by U.S. missile. Sara Ismaeel, 8, who was injured in a missile attack seen dying from a septic infection in a hospital bed at the Chawadar Saddam Hospital. 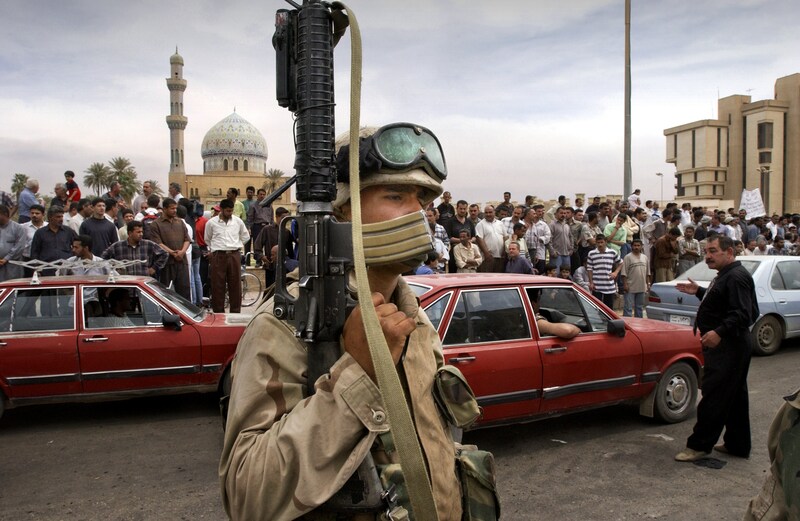 Wide spread looting broke out all over the capital as American forces continued to set up road blocks and patrols while the Fedyeen loyal to Saddam Hussein were still trying to carry out sporadic attacks against the U.S Army and the Shiite population of Baghdad. Shias pass by the during the annual pilgrimage to pray at the holy shrines of Abbas and Hussein, which was banned by Saddam Hussein for the last twenty-five years. The city of Kerbala, was strongly influenced by the Persians who where the dominant ethnic group, making up 75% of the population at the turn of the 20th century, at the time when there were around 50,000 people in the city. Kerbala also suffered from severe water shortage, which reduced the numbers of pilgrims. The building of a dam at the head of the Husayniyya Canal in 1737 largely solved the water problems. 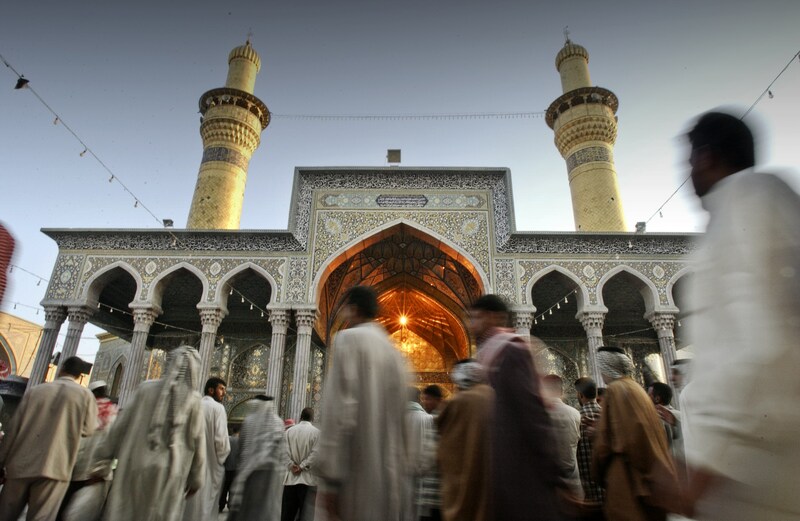 The city replaced Isfahan as the main centre of Shia scholarship and Kerbala maintained strong links with Iran. The Kammuna family, related to the Shahs, was custodians of the shrines and practically ran the city until the time of the British mandate when control of the city passed to seven mukhtars who started to receive a salary from the municipality who were succeeded by Iraqi government employees. The piety and unshakeable belief of the Muslims who visit the sanctuaries is illustrated by heart-rending acts of devotion such as kissing the grails that surround the shrines. U.S. Marines from the 1st Expeditionary Force train for urban combat at their base near Falluja. Iraqi Prime Minister Allawi said that the effort to resolve peacefully the situation in Falluja has entered a final stage and that U.S Forces have were preparing for an offensive that would begin soon and risk civilian casualties. Mosque employee Nihad Salman, 26, prepares the body of Lamiamh Ali, 6, for burial. Four siblings were injured when a cluster bomb exploded while they were playing outside. Two of the children, Dana Ali, 8, and Lamiamh Ali, 6, died as a result of the incident. 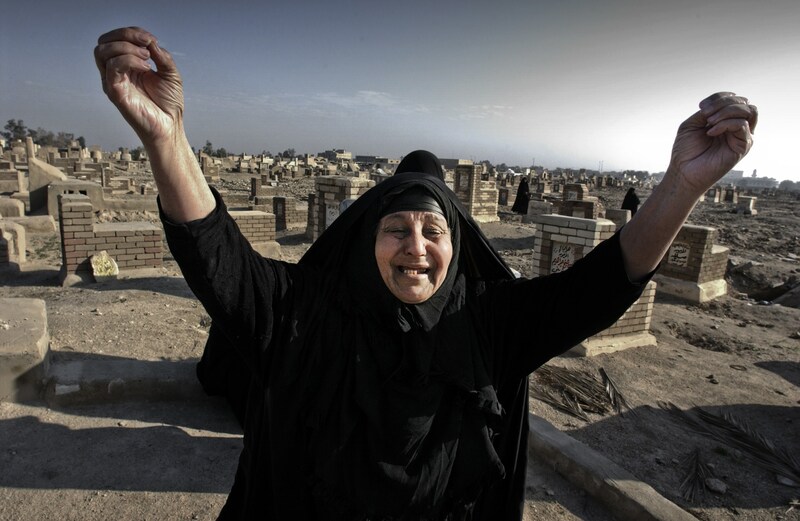 An Iraqi woman mourns her relatives at the Najaf cemetery to commemorate the Eid al-Adha. Iraqis from all over the country come to the cemetery, which is the world’s largest Islamic burial site and the final resting place for generations of Shia Muslims, to mourn their relatives during Eid al-Adha. The Muslim holiday of Eid al-Adha (Festival of Sacrifice), takes place on the tenth day of the Islamic month Dhul-Hijjah, the last month of the Islamic calendar in which millions of Muslims from around the world make an annual pilgrimage to Makkah in order to worship Allah and to commemorate the willingness of the Prophet Abraham to sacrifice his son Ishmael. To celebrate, Muslims slaughter sheep, goats, cows and camels, and one third of the meat is distributed to the poor, one third to neighbors and relatives, while one third is kept by the person who offered the sacrifice for use within his or her own family. U.S Soldiers from Alfa Company 1/18 Infantry, 4th Infantry Division out of Fort Carson, Colorado and the 3rd Squadron 7th United States Cavalry Regiment 3rd Infantry Division out of Fort Stewart, Georgia belonging to Task Force Iron horse interrogate a member of a family about a relative during a raid in a house, during Operation Sidewinder. The operation was executed by aviation attack, as well as armor and infantry forces detaining 14 suspected opposition members and the seizure of multiple illegal weapons along with various military documents. Task Force Iron horse conducted more than 20 simultaneous raids detaining more than 60 suspects, and is the third in a series of operations. The first two were operations Peninsula Strike and Desert Scorpion, focusing on sweeping through the task force’s area of operations to root out elements undermining coalition efforts to restore basic infrastructure and stability in the region. The raids target former Ba’ath Party loyalists, terrorists suspected of perpetrating attacks against US forces and former Iraqi military leaders, and to locate weapons and ammunition caches. The nexus of paramilitary activity in central Iraq is located along an approximate stretch of the Tigris River from Samarra to Baghdad, and is the location of several destabilizing influences in the region. Iraqis protest during a small demonstration asking for police protection in front of the Palestine Hotel, headquarter of the U.S Forces and foreign media. Wide spread looting broke out all over the capital as American forces continued to set up road blocks and patrols. 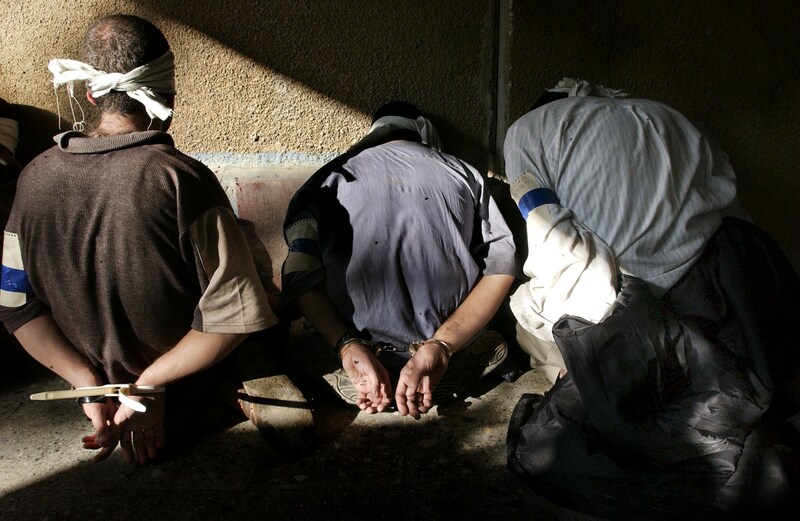 An Iraqi prisoner of war, member of the Republican Guard, arrested after he had been found in possession of a rifle and ammunition in the main Square of Tikrit, 175 km north of the Capital Baghdad. The relatives of fallen Iraqi police officer overcome with emotions as his coffin is brought into their house. The police officer died at a site where a suicide bomber killed himself and at least five other people at a police station in the northern Iraqi city of Kirkuk. According to Police official, the attack had been carried out by a suicide bomber driving a car in a Kurdish section of Kirkuk, an oil-rich city 155 miles north of Baghdad where ethnic tensions are running high. The attack occurred shortly before Defense Secretary Donald Rumsfeld flew into Baghdad on an unannounced visit to assess security in the troubled country almost a year after the U.S. led invasion began. U.S Soldiers from Alfa Company 1/18 Infantry, 4th Infantry Division out of Fort Carson, Colorado and the 3rd Squadron 7th United States Cavalry Regiment 3rd Infantry Division out of Fort Stewart, Georgia belonging to Task Force Iron horse detain a prisoner that had shot at a U.S helicopter after he resisted the arrest and was brought back to the detention center at the FOB (Forward Operation Base) during Operation Sidewinder The operation was executed by aviation attack, as well as armor and infantry forces detaining 14 suspected opposition members and the seizure of multiple illegal weapons along with various military documents. Task Force Iron horse conducted more than 20 simultaneous raids detaining more than 60 suspects, and is the third in a series of operations. The first two were operations Peninsula Strike and Desert Scorpion, focusing on sweeping through the task force’s area of operations to root out elements undermining coalition efforts to restore basic infrastructure and stability in the region. The raids target former Ba’ath Party loyalists, terrorists suspected of perpetrating attacks against US forces and former Iraqi military leaders, and to locate weapons and ammunition caches. The nexus of paramilitary activity in central Iraq is located along an approximate stretch of the Tigris River from Samarra to Baghdad, and is the location of several destabilizing influences in the region. 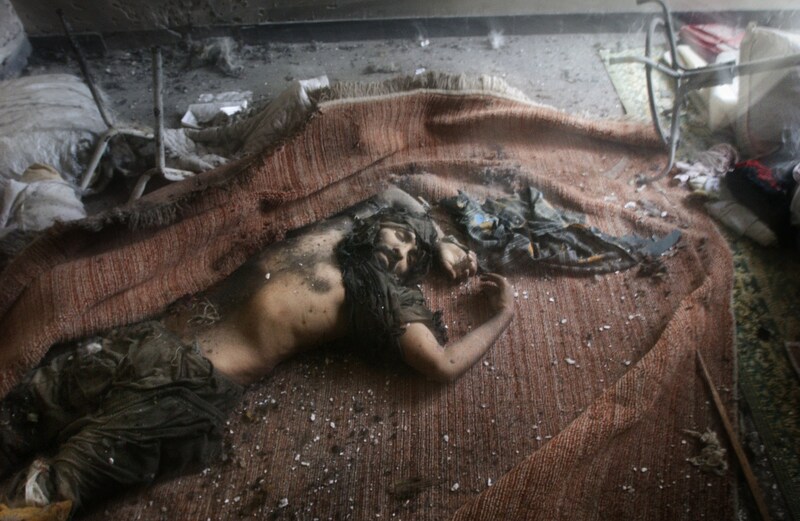 The body of a dead insurgent who was shot by U.S Marines from the 1st U.S Marines Expeditionary Force, 1st Battalion, 3rd Marines Regiment, Bravo Company after he attempted to launch a grenade at the marines while they were clearing a house during a raid. 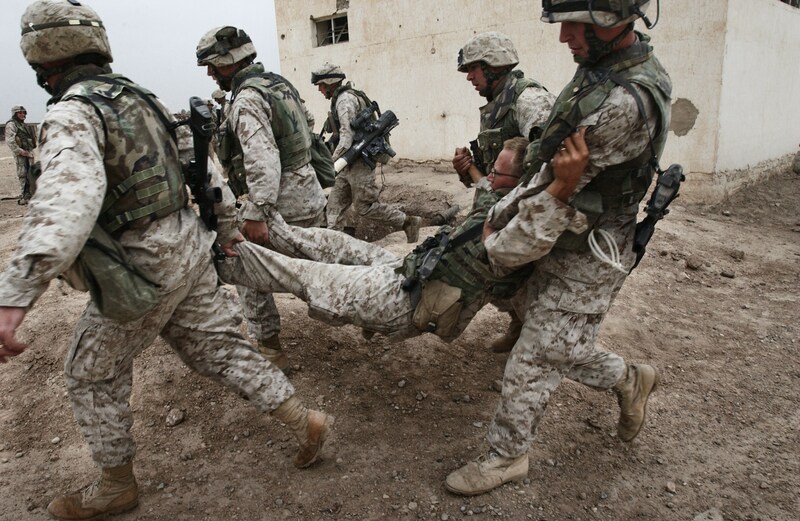 Marines supported by tanks and artillery launched a major attack against insurgent pockets of resistance in southern Fallujah, searching house by house and arresting all males in combat age between 15 years old and 55 years old. 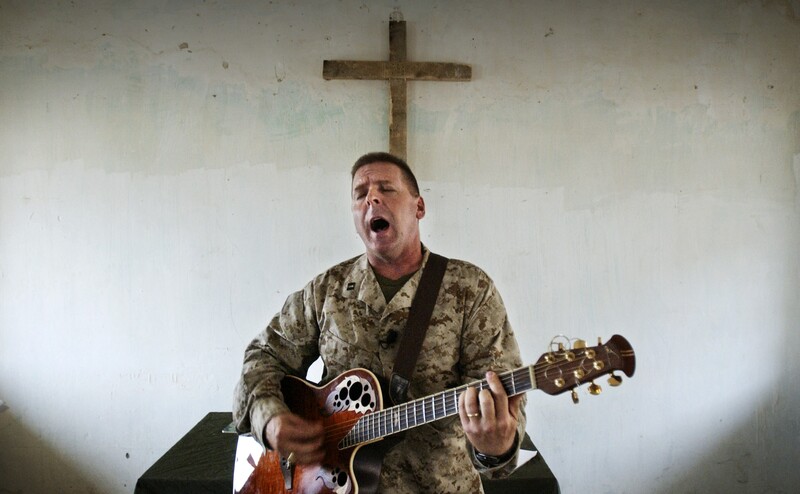 A U.S Marine from the 1st Expeditionary Force chants and play a guitar during a Protestant religious service at the chapel at their base near Falluja. Iraqi Prime Minister, Allawi said that the effort to resolve peacefully the situation in Falluja had entered a final stage and that U.S Forces were preparing for an offensive that could possibly happen soon and result in civilian casualties. 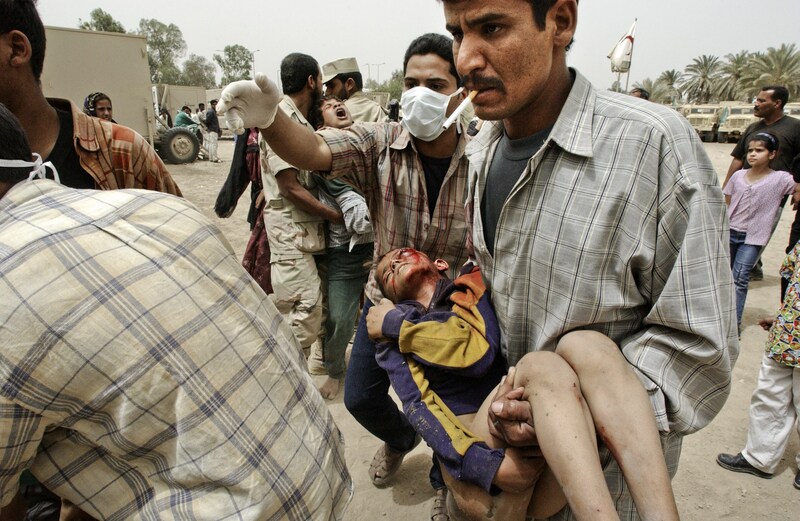 Family members carry the body of Hamza Ali, 6, to a field hospital set up by the Saudi Arabian government and the Red Crescent. Hamza was one of four siblings who were injured when a cluster bomb exploded while they were playing outside. Hamza and another of the children died as a result of the incident. 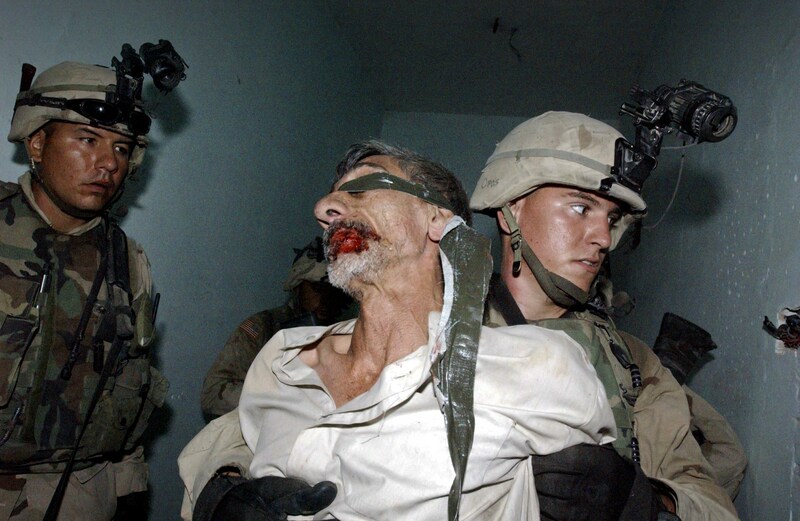 A U.S Marines from the 1st U.S Marines Expeditionary Force, 1st Battalion, 3rd Marines Regiment, Bravo Company holds a suspected member of Iraqi guerrillas arrested during the ground offensive in Fallujah. U.S. troops powered their way into the center of the insurgent stronghold of Fallujah on Tuesday, overwhelming small bands of guerrillas with massive force, searching homes along the city’s deserted, narrow passageways and using loudspeakers to try to pull militants out onto the streets. 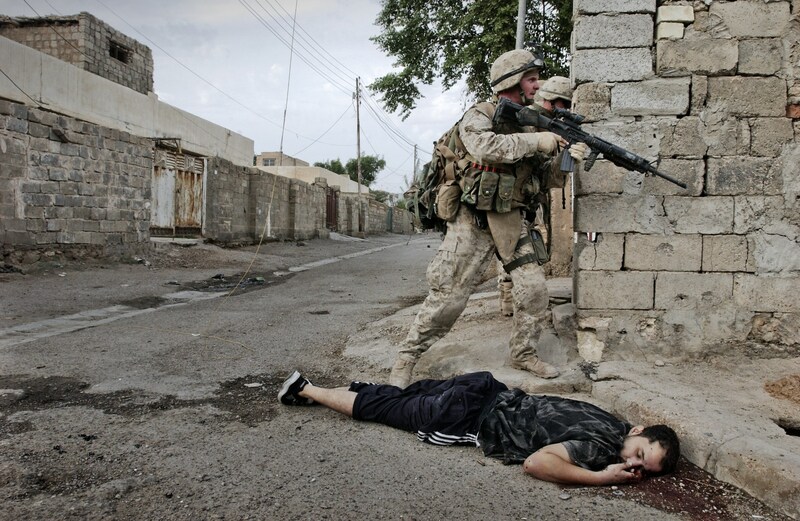 A U.S Marine from the 1st U.S Marines Expeditionary Force, 1st Battalion, 3rd Marines Regiment, Bravo Company passes by the dead body of a suspected member of the Iraqi guerrillas. U.S. troops powered their way into the center of the insurgent stronghold of Fallujah, overwhelming small bands of guerrillas with massive force, searching homes along the city’s deserted, narrow passageways and using loudspeakers to try to lure militants onto the streets. 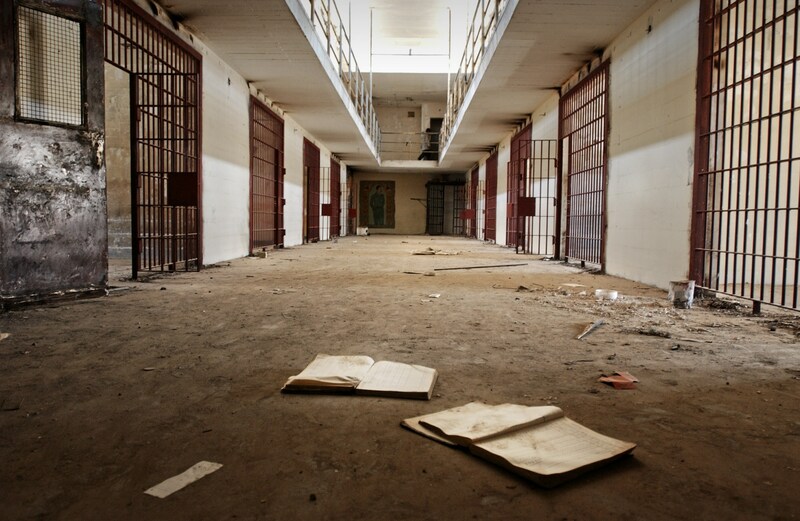 Empty cells at the Abugreb Prison, 10 km West of Baghdad. After years of rumors of atrocities inside the prison Iraqis can now see the facility first hand. U.S Marines from the 1st U.S Marines Expeditionary Force, 1st Battalion, 3rd Marines Regiment, Charlie Company, on their amphibious assault vehicle during the offensive in Fallujah. Marines supported by tanks and artillery launched a major attack against insurgent pockets of resistance in southern Fallujah, searching house by house and arresting all males in combat age between 15 years old and 55 years old. 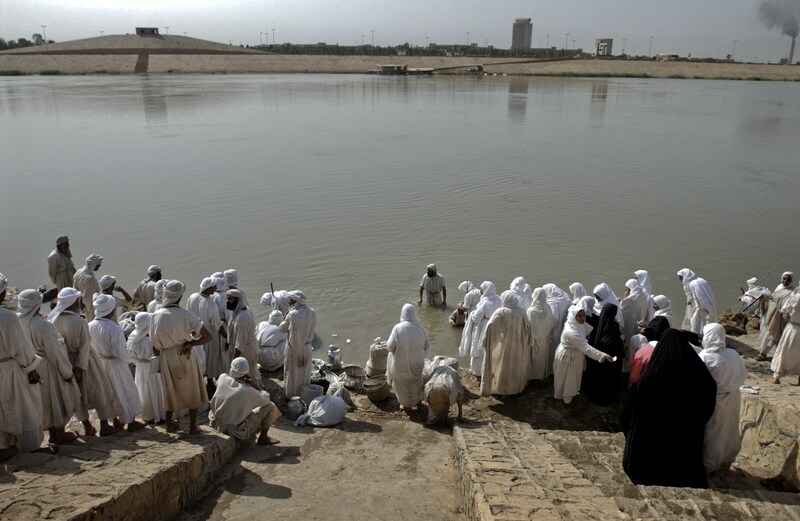 Mandaean Sabian followers prepare to be baptized in the Tigris river during the ceremony of the Golden baptism (Dihwa id Dihana), one of the most important rituals of the Mandean religion. A Mandaean Sabian cleric conducted the ceremony, in order to purify followers, both physically and spiritually. Mandaean Sabians, a Gnostic religion, regards John the Baptist as their last prophet and are said to be those who are baptized and who know the religion of God, known as The Great Life or The Eternal Life in the Ginza Raba, their holy book. Mandaean Sabians do not allow people to convert into or out of the religion and do not allow mixed marriages. The Mandaean Sabians direct their faces northward while practicing their religious rites because they believe that the world of Light (paradise) lies in that sacred place of the universe where souls go when the journey of life ends. They believe that once they travel to the Light, they will enjoy immortality alongside God. The Mandaean Sabians100,000 strong, live mainly in Iraq and Iran, but there are Mandaean Sabian communities located in Europe, the U.S. as well as in Australia. 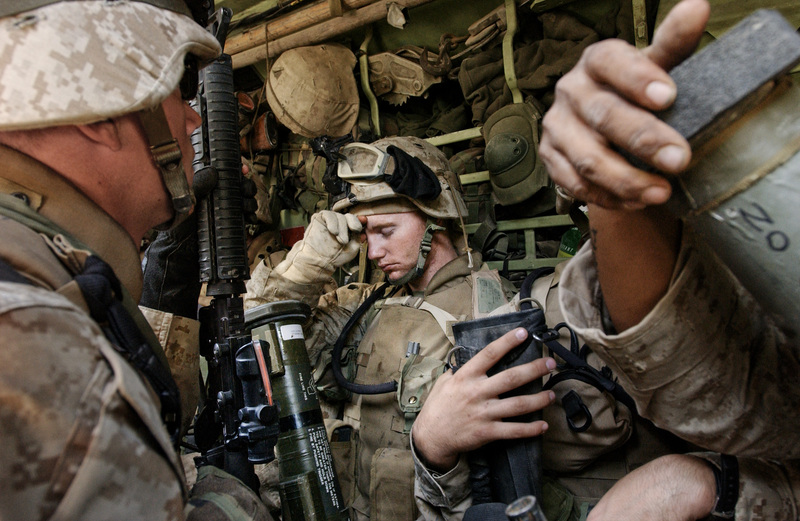 U.S Marines from the 1st U.S Marines Expeditionary Force, 1st Battalion, 3rd Marines Regiment, Bravo Company, before leaving for a raid to clear houses and search for the last insurgents in Fallujah. Marines supported by tanks and artillery launched a major attack against insurgent pockets of resistance in southern Fallujah, searching house by house and arresting all males in combat age between 15 years old and 55 years old.